The TaylorMade P770 irons combine forged 1025 carbon steel heads with precision-milled faces and grooves for a soft-solid feel at impact and performance that is both workable and forgiving. Designed for highly skilled players, the irons feature 70-gram tungsten back-bar weighting in the mid and long irons (3-7) and a one-piece forged cavity back construction in the short irons (8-AW) for added feel and control. Further enhancements include a flatter, medium cambered sole and tighter leading edge for improved turf interaction as well as a thin topline and progressive offset for a clean look at address. The higher MOI allows for ball speed consistency and more forgiveness while the lower center of gravity creates a higher launch angle than its predecessors. 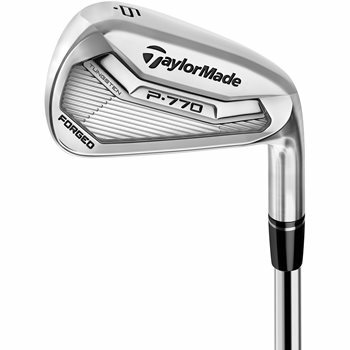 The P770 irons are high performance with improved playability and great sound and feel. Review by Chris, 16 days ago. Review by Mitch C., 3 months ago. Hi. For the used P770's, is the KBS Tour FLT shaft in a stiff 110 or 120? Thx. Which grip comes on this set? Hi.. can't I get these irons at 500 us dollors?